Child protection agencies across Bradford District are joining together to mark national child sexual exploitation (CSE) awareness day which takes place on Sunday 18 March. Activities to mark the day will take place in Bradford on Friday 16 March and in Keighley on Monday 19 March. All events are free and everyone is welcome. 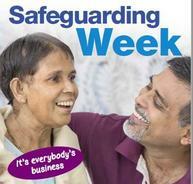 Safeguarding Week is earlier this year in Bradford and across West Yorkshire and runs from 25 to 29 June. The theme this year is preventing coercion control, exploitation and grooming. If your organisation wants to plan an event for the week and would like to publish this in the brochure, you will need to complete the proforma and return it to us no later than 29 March. More details about the week are available on our website. The Department for Education’s campaign help tackle child abuse will be running from 12 March with a range or news stories and promotion across the media and social media sites such as this short video. The key call-to-action for the campaign is to get the public to visit www.gov.uk/tacklechildabuse, where they can enter their postcode to contact their local council and report. A range of material is available that organisations can use to raise awareness of the campaign. Please visit the campaign site to access, use and share the new materials. Designated Safeguarding Leads and Safer Schools Police Officers are invited to book places on one of two briefings led by Bradford Council’s Prevent Team and the North East Counter Terrorism Unit.